... fits between breasts, inserts neatly in a hole, and works best when jerked? A seatbelt you filthy minded reader - you need to buy some timber from me and clean up your life ! ... which compensated for some rather shite Autumn ones I was after as ever, more stock - in particular dry Oak. I bought a parcel from a new source and booked a lorry for it and a few uncut things for us to do like Yew, Beech and Cedar. I arranged it for a Tuesday as I have Dave and Mike and told Graham the farmer I might need a couple of bits lifted over the gate but would sort the other stuff first. The lorry was due lunchtime but due to a long tale of woe that befell Kevin the lorry which I won't bore you with, it was well after 4 before he arrived. ... citing preparations for a trip to his native Jockland. Looking at the stack of Oak I briefly wished I had bought less! Mike and I bravely hand balled the planks off and into the woods sweating and creaking as old boys do whilst wondering if we might be there all night. Being all night wasn't an option as the Pick Up had to be dropped off by 6 for it's MOT. 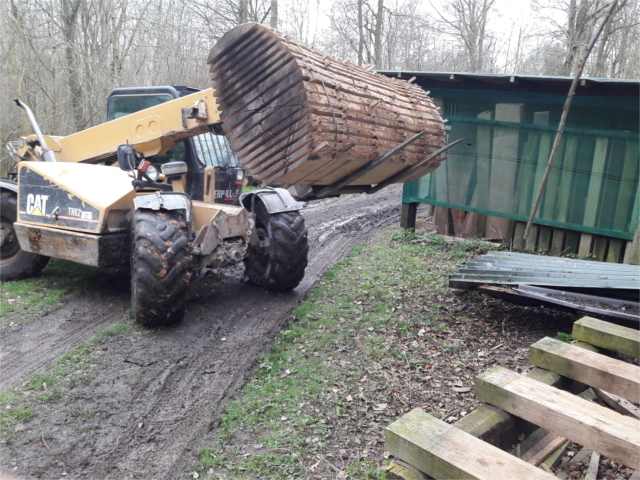 ... turned up with his mega Cat telehandler and got all the difficult bits off the lorry and into the woods without any Stephen Sondheim songs or any disasters. 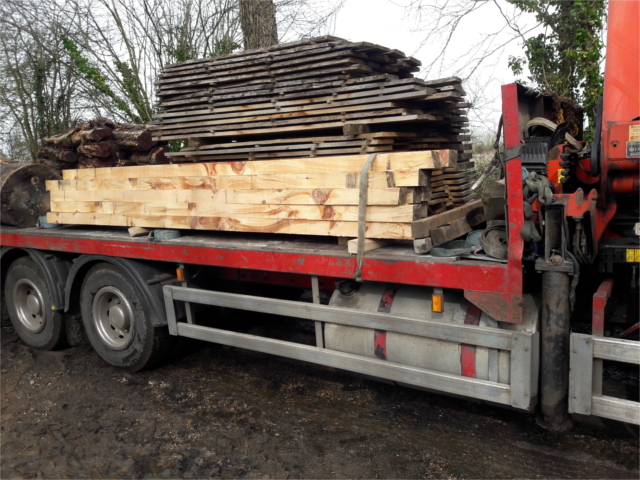 Taking a heavy stack of wood down the very wet and muddy track into the woods lifting over two gates needs experience and a good ring piece lucky he seems to have both though I can't say for sure about the latter, you'll be relieved to know. With his help it was off and stowed in just over an hour. Being gently placed in it's home for air drying is the wonderful Olive Ash shown in last blog. 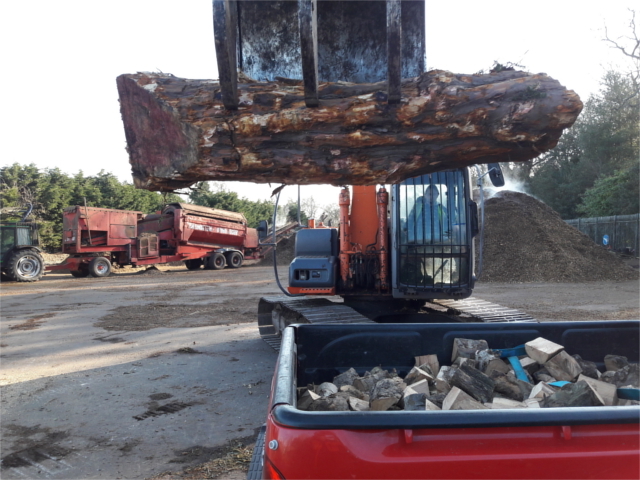 ... meant going to the orchards of Kent at the crack of dawn to beat the M25 car park and having loaded some A1 logs decided to call in at my mate's in Croydon who popped the interesting bit of Yew pictured below on top. Tragically the middle four boards which we meticulously book matched turned out to be like some women ... from a distance they looked good - even beautiful but up close revealed serious flaws! ... will be unable to resist trying to fill the cracks! ... having got your attention here's where we are at with the most popular wood I have. Nearly everyone who comes can't resist a plank or two and it's hard to find! Some years we pick up two or three good ones but not last year which left me seeking out the Walnut king Andy who scours the UK for it and finds the best available. 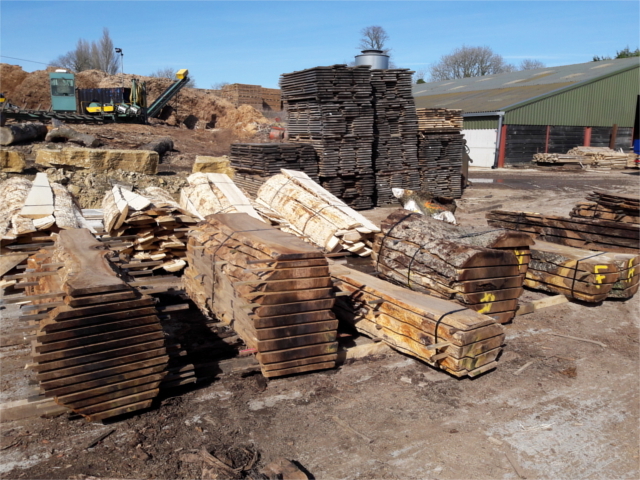 ... of Walnut logs at Helmdon Sawmill and saw all of them in a day. Some are weird and wonderful shapes and need jet washing. Some have faults and shakes like all timber but all of Andy's logs have great colour and figure, he won't buy dull ones. He specifically needs perfect quartersawn top grade stuff for his guitar set business which leaves the rest for me to hoover up eagerly. We've been dealing with each other over 15 years now and it's fair to say he looks after me well. ... pictured below - the strong smell of freshly sawn Walnut lingered in my senses as I went home with an empty wallet & a big smile that should pass to you when you buy it when it's dry. Like all timber it isn't perfect with the odd shake ... the log on the left has a bit of a hole through quite a few planks probably from a branch that was developed into a home for a winged creature but those sort of defects are no problem to the resin craftsmen. There's another even more impressive quartersawn one just out of sight - this is the most Walnut I have acquired at one time! ... wood as a present for someone else. This is fine for my BBQ wood mixed box - in fact it's a fine gift that is appreciated by the recipient & me! However, most woodworkers like to choose their own timber if not their underwear. It's on a quality bit of card and on the back is a colour print of google maps showing where I am. ... David when he came to spend it. Turned out she was even better than she sounded & offered to do a more generic coupon/gift voucher that other customers can download & give to their significant others. 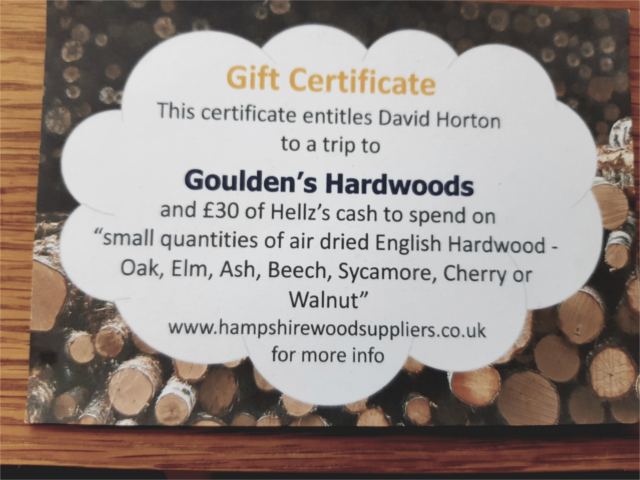 The 30 quid Helen contributed was raised to 40 as she need some blocks for yoga classes ( no idea why or how) and of course as soon as David saw my store of goodies he couldn't resist spending well over twice that - this often happens as people come for a plank or two of something and see a bit they must have ... & of course I must let Sir or Madam have what they want! ... me new Pick Up and hopefully some quality Elm that I am in the process of getting from Scotland. Should also have other stuff to get you driving up the track with pockets full of readies. Bank transfers also good but gone off crypto currencies!